Washington, D.C. – September 11, 1998 marks the twenty-fifth anniversary of the military coup led by General Augusto Pinochet. The violent overthrow of the democratically-elected Popular Unity government of Salvador Allende changed the course of the country that Chilean poet Pablo Neruda described as "a long petal of sea, wine and snow"; because of CIA covert intervention in Chile, and the repressive character of General Pinochet's rule, the coup became the most notorious military takeover in the annals of Latin American history. Revelations that President Richard Nixon had ordered the CIA to "make the economy scream" in Chile to "prevent Allende from coming to power or to unseat him," prompted a major scandal in the mid-1970s, and a major investigation by the U.S. Senate. Since the coup, however, few U.S. documents relating to Chile have been actually declassified- -until recently. Through Freedom of Information Act requests, and other avenues of declassification, the National Security Archive has been able to compile a collection of declassified records that shed light on events in Chile between 1970 and 1976. Cables written by U.S. Ambassador Edward Korry after Allende's election, detailing conversations with President Eduardo Frei on how to block the president-elect from being inaugurated. The cables contain detailed descriptions and opinions on the various political forces in Chile, including the Chilean military, the Christian Democrat Party, and the U.S. business community. National Security Council strategy papers which record efforts to "destabilize" Chile economically, and isolate Allende's government diplomatically, between 1970 and 1973. State Department and NSC memoranda and cables after the coup, providing evidence of human rights atrocities under the new military regime led by General Pinochet. FBI documents on Operation Condor--the state-sponsored terrorism of the Chilean secret police, DINA. The documents, including summaries of prison letters written by DINA agent Michael Townley, provide evidence on the carbombing assassination of Orlando Letelier and Ronni Moffitt in Washington D.C., and the murder of Chilean General Carlos Prats and his wife in Buenos Aires, among other operations. These documents, and many thousands of other CIA, NSC, and Defense Department records that are still classified secret, remain relevant to ongoing human rights investigations in Chile, Spain and other countries, and unresolved acts of international terrorism conducted by the Chilean secret police. Eventually, international pressure, and concerted use of the U.S. laws on declassification will force more of the still-buried record into the public domain--providing evidence for future judicial, and historical accountability. Click on the to view each document. This report provides a summary of information taken from prison letters written by Michael Townley, the DINA agent responsible for the assassination of Orlando Letelier. This report includes information not directly provided to the FBI by Townley, but drawn from analysis of his correspondence with his DINA handler: details about meetings between Chilean President Pinochet and Italian terrorists and spies, codenames and activities of DINA personnel, collaboration between DINA and anti-Castro Cubans; the creation of a fake terrorist organization to take the blame for a DINA kidnapping in Argentina; DINA involvement in relations between Great Britain and Northern Ireland; and Townley's fear that information about kidnappings and assassinations of prominent critics of Pinochet would somehow be traced back to him. This cable, written by the FBI's attache in Buenos Aires, Robert Scherrer, summarizes intelligence information provided by a "confidential source abroad" about Operation Condor, a South American joint intelligence operation designed to "eliminate Marxist terrorist activities in the area." The cable reports that Chile is the center of Operation Condor, and provides information about "special teams" which travel "anywhere in the world... to carry out sanctions up to assassination against terrorists or supporters of terrorist organizations." Several sections relating to these special teams have been excised. The cable suggests that the assassination of the Chilean Ambassador to the United States, Orlando Letelier, may have been carried out as an action of Operation Condor. This memorandum, written by Stephen Low of the National Security Council, calls Scowcroft's attention to Pinochet's plans to visit the United States, and his requested meeting with U.S. President Ford. The memo states that the NSC asked the U.S. Ambassador to Chile, David Popper, to discourage the meeting by telling the Chileans that President Ford's schedule is full. Fearing that such a visit would "stimulate criticism" and foster embarrassment, Low suggests an "informal talk" with Chile's Ambassador Trucco. This memorandum, from Stephen Low to President Ford's National Security Advisor, General Brent Scowcroft, conveys concern about wavering U.S. policy toward Chile in light of reports of human rights violations. The memo reveals a division within the U.S. embassy over dealing with Chile, with a number of officials now believing that all U.S. military and economic assistance should be terminated until the regime's human rights record improves. According to Low, by reducing aid and sending "mixed signals" to the Chileans, the United States risks precipitating a crisis situation in Chile. Low concludes his memo by recommending that Scowcroft schedule a special meeting in which U.S. agencies can "clarify guidelines for future policy." This letter, one of a number sent by FBI attache Robert Scherrer to Chilean General Ernesto Baeza, provides intelligence obtained through the interrogation of a captured Chilean leftist, Jorge Isaac Fuentes. The document records U.S. collaboration with Chile's security forces, including the promise of surveillance of subjects inside the United States. Fuentes was detained through Operation Condor--a network of Chilean, Argentinian and Paraguayan secret police agencies which coordinated tracking, capturing and killing opponents. According to the Report of the Chilean National Commission on Truth and Reconciliation, he was tortured in Paraguay, turned over to the Chilean secret police, and disappeared. This heavily excised Intelligence Report from the Defense Attache in Santiago Chile, describes the growth of DINA, the national intelligence arm of the Chilean government and "the sole responsible agency for internal subversive matters." Many of the excised portions provide details about the strained relations between DINA and the Chilean Armed Forces because of DINA's exclusive power. The report states that the head of DINA, Colonel Manuel Contreras, "has reported exclusively to, and received orders only from, President Pinochet." This telegram, written by Ambassador Popper and directed to the U.S. Secretary of State, reports on a meeting between Assistant Secretary of State Jack Kubisch, and Chile's foreign minister General Huerta on the controversy over two U.S. citizens--Charles Horman and Frank Teruggi--executed by the military after the coup. Kubisch notes that he is raising this issue "in the context of the need to be careful to keep relatively small issues in our relationship from making our cooperation more difficult." This memo, sent to the Secretary of State by Jack Kubisch, states that summary executions in the nineteen days following the coup totaled 320--more than three times the publicly acknowledged figure. At the same time, Kubisch reports on new economic assistance just authorized by the Nixon administration. The memo provides information about the Chilean military's justification for the continued executions. It also includes a situation report and human rights fact sheet on Chile. In a situation report, U.S. Naval attache Patrick Ryan, reports positively on events in Chile during the coup. He characterizes September 11 as "our D-Day," and states that "Chile's coup de etat [sic] was close to perfect." His report provides details on Chilean military operations during and after the coup, as well as glowing commentary on the character of the new regime. This DIA biographic summary covers the military career of the leader of Chile's military coup, General Augusto Pinochet. The DIA, an intelligence branch of the U.S. Armed Forces, routinely collects "Biographic Data" on all high military officials around the world. The heavy deletions are likely to conceal Chilean sources providing information on Pinochet, his own contacts with U.S. officials, and commentary on his character, reputation, political orientation and actions during his career. In response to a November 27 directive from Kissinger, an inter-agency Ad Hoc Working Group on Chile prepared this set of strategy papers covering a range of possible sanctions and pressures against the new Allende government. These included a possible diplomatic effort to force Chile to withdraw--or be expelled--from the Organization of American States as well as consultations with other Latin American countries "to promote their sharing of our concern over Chile." The documents show that the Nixon administration did engage in an invisible economic blockade against Allende, intervening at the World Bank, IDB, and Export-Import bank to curtail or terminate credits and loans to Chile before Allende had been in office for a month. The CIA prepared a summary of its efforts to prevent Allende's ratification as president and to foment a coup in Chile-- track I and track II covert operations. The summary details the composition of the Task Force, headed by David Atlee Phillips, the team of covert operatives "inserted individually into Chile," and their contacts with Col. Paul Winert, the U.S. Army Attache detailed to the CIA for this operation. It reviews the propaganda operations designed to push Chilean president Eduardo Frei to support "a military coup which would prevent Allende from taking office on 3 November." This memorandum summarizes the presidential decisions regarding changes in U.S. policy toward Chile following Allende's election. Written by Henry Kissinger and sent to the Secretaries of State, Defense, the Director of the Office of Emergency Preparedness and the Director of Central Intelligence, this memo directs U.S. agencies to adopt a "cool" posture toward Allende's government, in order to prevent his consolidation of power and "limit [his] ability to implement policies contrary to U.S. and hemisphere interests." The memo states that existing U.S. assistance and investments in Chile should be reduced, and no new commitments undertaken. Furthermore, according to Kissinger's memo, "close relations" should be established and maintained with military leaders throughout Latin America to facilitate coordination of pressure and other opposition efforts. This paper provides the talking points for CIA director Richard Helms to brief the NSC on the situation in Chile. The briefing contains details on the failed coup attempt on October 22--but does not acknowledge a CIA role in the assassination of General Rene Schneider. Helms also assesses Allende's "tenacious" character and Soviet policy toward Chile. Intelligence suggests that Chile's socialists, he informs council members, "will exercise restraint in promoting closer ties with Russia." A comprehensive secret/sensitive options paper, prepared for Henry Kissinger and the National Security Council on the day of Allende's inauguration, laid out U.S. objectives, interests and potential policy toward Chile. U.S. interests were defined as preventing Chile from falling under Communist control and preventing the rest of Latin America from following Chile "as a model." Option C--maintaining an "outwardly cool posture" while working behind the scenes to undermine the Allende government through economic pressures and diplomatic isolation--was chosen by Nixon. CIA operations and options are not included in this document. These three cables between CIA headquarters in Langley, VA., and the CIA Station in Santiago address the secret shipment of weapons and ammunition for use in a plot to kidnap the Chilean military commander, General Rene Schneider. "Neutralizing" Schneider was a key prerequisite for a military coup; he opposed any intervention by the armed forces to block Allende's constitutional election. The CIA supplied a group of Chilean officers led by General Camilo Valenzuela with "sterile" weapons for the operation which was to be blamed on Allende supporters and prompt a military takeover. Instead, on October 22, General Schneider was killed by another group of plotters the CIA had been collaborating with, led by retired General Roberto Viaux. 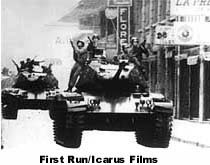 Instead of a coup, the military and the country rallied behind Allende's ratification by Chile's Congress on October 24. In a secret cable, CIA deputy director of plans, Thomas Karamessines, conveys Kissinger's orders to CIA station chief in Santiago, Henry Hecksher: "It is firm and continuing policy that Allende be overthrown by a coup." The "operating guidance" makes it clear that these operations are to be conducted so as to hide the "American hand," and that the CIA is to ignore any orders to the contrary from Ambassador Korry who has not been informed of Track II operations. This memcon records a discussion of promoting a coup in Chile, known as "Track II" of covert operations to block Allende. The three officials discuss the possibility that the plot of one Chilean military official, Roberto Viaux, might fail with "unfortunate repercussions" for U.S. objectives. Kissinger orders the CIA to "continue keeping the pressure on every Allende weak spot in sight." These minutes record the first meeting between CIA director Helms and high agency officials on covert operations--codenamed "FUBELT"--against Allende. A special task force under the supervision of CIA deputy director of plans, Thomas Karamessines, is established, headed by veteran agent David Atlee Phillips. The memorandum notes that the CIA must prepare an action plan for National Security Advisor Henry Kissinger within 48 hours. These handwritten notes, taken by CIA director Richard Helms, record the orders of the President of the United States, Richard Nixon, to foster a coup in Chile. Helms' notes reflect Nixon's orders: l in 10 chance perhaps, but save Chile! ; worth spending; not concerned; no involvement of embassy; $10,000,00 available, more if necessary; full-time job--best men we have; game plan; make the economy scream; 48 hours for plan of action. This presidential directive initiates major covert operations to block Allende's ascension to office, and promote a coup in Chile. This series of eight cables, written by U.S. Ambassador to Chile, Edward Korry, record the reaction and activities of the U.S. Embassy after the election of Salvador Allende's Popular Unity coalition. Known as "Korrygrams," his reports contain some of the most candid, and at times undiplomatic, opinions and observations ever offered by a U.S. Ambassador. With titles such as "No Hope for Chile," and "Some Hope for Chile," Korry provides extensive details about political efforts to block Allende's ratification by the Chilean Congress. The cables report on the activities of Chile's political institutions in response to Allende's election and provide Korry's explicit assessments of the character of key Chilean leaders, particularly the outgoing president, Eduardo Frei.